Assessments of Edward Wakefield boil down to questions about his integrity and intellectual profundity. Sympathisers say he had both, the extreme critics say he had neither, moderate critics while condemning him for lacking the former, claim he had something of the latter. Edward Gibbon Wakefield was born probably in London, England, on 20 March 1796. His father, Edward Wakefield, was a farmer and land agent, who had married Susanna Crash in London in 1791. Edward Gibbon was the oldest son and second of nine children. 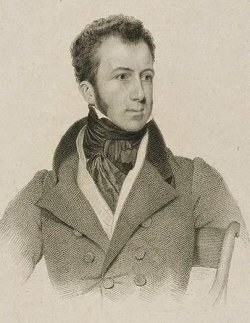 After the death of Susanna Wakefield, Edward Gibbon’s father, in 1824, married Frances Davies, daughter of the Reverend Dr Davies, headmaster of Macclesfield Grammar School. The driving force in Edward Gibbon Wakefield’s life was his appetite for power and influence. As a child he was brought up under extreme habits of liberty. This lax environment fostered a love and an aptitude for bending the will of others through obstinacy, charm and fast talking. His father, a close friend of Francis Place and James Mill, was so wrapped up in his intellectual and philanthropic concerns, that he threw the burden of raising a young family on his wife. Stricken with chronic ill health to the point of semi-invalidism, she was not able to cope domestically, or control little Edward. To help out, the undisciplined child’s grandmother, Priscilla Wakefield, took him and his elder sister into her London house for lengthy periods. Her influence, however, did little to curb the wilfulness of the boy. Priscilla Wakefield, an unorthodox Quaker, was preoccupied with her own literary and charitable interests; she wrote children’s stories and invented the idea of savings banks, and was harassed by the many problems of her sons and downwardly mobile husband. At his first school, Mr Haigh’s in Tottenham, Edward was constantly in trouble, and was withdrawn in 1807; he went to Westminster School but in 1810 he refused to attend; finally he was sent to Edinburgh High School, from which he was removed in 1811 after causing trouble. He then spent two years at home with no occupation. Although admitted to Gray’s Inn in October 1813, Wakefield did not practise law. Instead, in 1814 he became a messenger for William Hill, an employee in the diplomatic service, and travelled extensively on the Continent.